Another Myki stuff-up has been found. Myki cards have a four year lifespan. 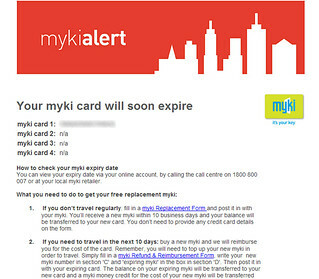 With many cards bought in Geelong in late-2008 and early-2009 now expiring, a number of users are getting replacement cards. Some are going back to the original retail outlets, post offices in Geelong and Corio, and buying new cards (the cost of which can be refunded as part of the expiry process). Lo and behold, they’re finding that those new replacement cards also expire this year. It appears to be because the expiry date of cards sold at retail outlets that don’t have Myki consoles is set during the card distribution stage, and these retailers are still selling stock from 2009. This explains why cards like my original one expired on 22nd of January 2013 even though it was bought in April 2009. The expiry clock can start ticking before it’s sold. It’s difficult at this stage to determine how many people are affected. Probably not a huge number, but PTV/Myki are aware of it and are hopefully moving quickly to resolve it. Update: Evidently cards sold from vending machines don’t have this problem; it’s unclear how it works with station booking offices and the newer retailers such as 7-11, which have consoles that may encode the cards when they are sold — ditto cards sold at station booking offices and newer retailers, as long as the Myki console is correctly used to initialise the card. One observer has noted that when buying the card, it’s worth ensuring you get a receipt just in case they don’t do this step correctly, as the card won’t function at all if not. Next → Next post: 10 minute trains are great, but why is the promotion of them so incredibly vague and uninformative? Just reinforces how stupid the whole concept of an artificial lifespan for plastic cards is. Are Myki exempt from the new Consumer protection laws? If you don’t get what you paid for surely a refund/replacement obligation exists at the retailer’s end of the transaction. Has anyone tested this provision in relation to Myki? It’s illegal to sell a four year old bottle of milk or a four year old loaf of bread. Isn’t there a law which says that products with a use-by date should have it stamped on them ? @enno, if you’re trying to eat your Myki card, you’re using it wrong. @Daniel – But has anyone tested to see if the readers will pick your card up through your stomach? Was over in Melbourne a couple weekends ago, had to get a Visitor Pack MyKi. All seemed to actually work fairly well, although having specific rules to tag off here, but not there seems bound to sow confusion. But actually seemed like a fairly reasonable card once you had it, the tag times didn’t seem that lengthy on the trams.